Welcome to The 08th MS Team rewatch! Everything seems shiny and new but that feeling went away pretty quickly after I saw just how beat up and rundown everything looks. Man, the Federation Army is in rough shape. It’s pretty surprising that they actually win the war. Let’s get into it. 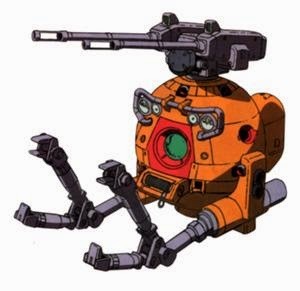 In the year UC 0079, approximately one month after the beginning of the One War, the new commander of the Federation’s 08th Mobile Suit Team is late. He’s supposed to arrive at one of the Federation’s bases in the jungles of Southeast Asia but he’s been detained. The story shifts to outer space where a transport ship is heading toward Earth. One of its passengers is Shiro Amada, the new commander. The ship witnesses a battle between a Zaku (a Mobile Suit belonging to the Zeon forces) and a Federation mobile suit. 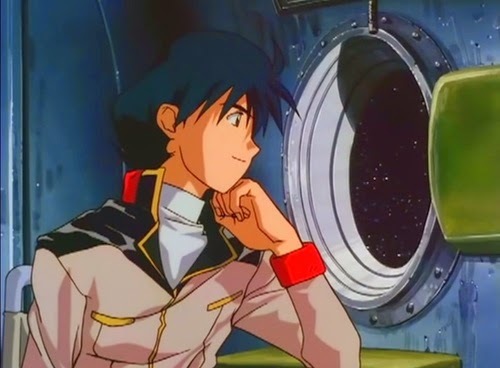 Shiro goes out in the only weapon aboard the ship, an RB-79K Ball, to help the damaged and losing mobile suit. He fights the Zaku to a standstill and discovered the pilot was a woman when she exits the cockpit to try and escape. Finding themselves drifting in military wreckage, Shiro and the Zeon pilot, a woman named Aina Sahalin, are both running low on oxygen. They decide to stop work together and find a way to attract the attention of their respective allies. They find a way to do just that by blowing up a piece of the wreckage. Back on the transporter ship, Shiro is once again on his way to Earth. As the first episode to a short anime series, this one doesn’t really amaze. Its structure and impact on the viewer is more akin to something like a prologue than a real introduction to a series. Important characters are barely introduced and we really do not get a sense of what the series will actually resemble. The real focus here is establishing the connection between Aina and Shiro. Sure, other characters that will form the 08th MS team also appear, more prominently Ensign Michel Ninorich whose negative attitude is a real downer, but they’re more appearances than introduction. The setting of the story itself isn’t established well. We get the year, UC 0079 which stands for year 79 of the Universal Century era. Fans who are already familiar with the Gundam metaseries will know what it means but for newcomers, it doesn’t really provide much information at all. Being mostly familiar with Mobile Suit Gundam Wing and Mobile Suit Gundam SEED, I really didn’t know anything about the setting of 08th MS Team. Gundam Wing took place in the After Colony timeline and Gundam SEED is set in the Cosmic Era timeline, both of which are alternate timelines and do not have the same setting as the Gundam series set in the Universal Century chronology. All I really knew about 08th MS Team is that it took place on Earth in a jungle somewhere. That’s all you really need to know. You quickly learn enough information to help you understand the story. Understanding how the franchise is structure as a whole will just help you put the story in context but it won’t have much of an impact on your enjoyment of this series. The focus of this episode is about Shiro and his encounter with Aina. The episode isn’t a good introduction to most of the series, but it did introduce Shiro and Aina well enough. It still feels like setup but that’s to be expected because setup, it clearly is. I have a hard time figuring out while Shiro tried to help Aina. It was his decision because her gun ran out of ammunition and instead of killing the enemy or capturing her as a prisoner; he decides to bandage her wound and ally himself to her long enough to get rescued by their respective allies. Shiro looks pretty young, maybe it’s his awkward and somewhat wrongheaded ay of being gallant toward a female enemy (something he was very surprised at, do the Zeon forces not have female soldiers?). Maybe he simply dislikes killing. That seems like a good explanation considering he didn’t try to destroy the Zaku, just immobilize it long enough for the mobile suit pilot to escape to safety. It was a good idea to have the relationship between Shiro and Aina established early on because it will play a larger role during the rest of the series. Having the characters be on two different sides of the war adds a lot of depth and thematic elements to the series. It’s not an original plot element for fictional war stories but I remember it being well done. I guess I’ll find out as I keep rewatching The 08th MS Team. Come back tomorrow for commentary of the second episode, “Gundams in the Jungle” which serves as a better introduction to the characters and setting of the series.